Amid a sea of apps and flip-flopping user interfaces, Windows 8 got itself a very intriguing selling point. In trying to retain what people liked about the wildly popular Windows 7 and attempting to compete with Apple's control of the mobile market, Microsoft has created a hybrid OS, creatively titled "Windows 8." 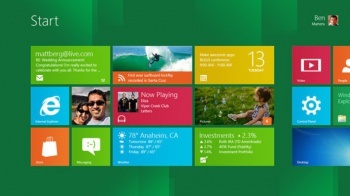 With a click or touch, it can swap between a heavily Windows 7-styled desktop mode and a mobile and tablet mode called "Metro", which seems to be closely related to Windows Phone 7. And if this strange split-personality wasn't enough, well, Microsoft went ahead and chucked a bit of Xbox in there for good measure, giving the new OS a built-in connection to Xbox LIVE. According to Microsoft spokesblogger Larry Herb's (aka Major Nelson) blog, adding LIVE functionality to the desktop and mobile side of Windows "brings your games, music, movies, and TV shows to your favorite Microsoft and Windows devices." One can't help but wonder if the introduction of Xbox LIVE to a desktop OS spells the death of Games for Windows LIVE, as it would provide essentially the same service. Perhaps if we're lucky, it will also lead to an increase in PC games that feature achievements and gamer score. In addition, Windows 8 will come with a built-in "Windows Store" (which, I am sure, is nothing like the App Store), where you will be able to browse, test, and purchase Apps for Metro. Microsoft will approve all third party apps, but says that it will keep the approval turnaround as short as 24 hours. No word on when the new OS might be out, but if past releases are anything to go by you should feel comfortable marking your calendar for this time next year.